This page represents the answers to a challenge posed in the page above, called Baskerville Serial Challenge. If you are interested in the challenge, and have not been there, go and read it before proceeding. Information Superhighway Patrolman White Mason, with his embedded 2nd-tier cookie, is monitoring your behavior from the master server, so behave yourself, now! The final episode was published in April 1902.
. . . the other cases you will be shown a heap of paper and you will look for this page of the Times among it. The odds are enormously against your finding it. There are ten shillings over in case of emergencies. Let me have a report by wire at Baker Street before evening. And now, Watson, it only remains for us to find out by wire the identity of the cabman, No. 2704, and then we will drop into one of the Bond Street picture galleries and fill in the time until we are due at the hotel. And then suddenly, in the very dead of the night, there came a sound to my ears, clear, resonant, and unmistakable. It was the sob of a woman, the muffled, strangling gasp of one who is torn by an uncontrollable sorrow. I sat up in bed and listened intently. The noise could not have been far away, and was certainly in the house. For half an hour I waited with every nerve on the alert, but there came no other sound save the chiming clock and the rustle of the ivy on the wall. I have had a long talk with Sir Henry this morning, and we have made a plan of campaign founded upon my observations of last night. I will not speak about it just now, but it should make my next report interesting reading. Much of what I tell you is no doubt quite irrelevant, but still I feel that it is best that I should let you have all the facts and leave you to select for yourself those which will be of most service to you in helping you to your conclusions. We are certainly making some progress. So far as the Barrymores go we have found the motive of their actions, and that has cleared up the situation very much. But the moor with its mysteries and its strange inhabitants remains as inscrutable as ever. Perhaps in my next I may be able to throw some light upon this also. Best of all would it be if if (sic) you could come down to us.
. . . coming nearer and nearer. I shrank back into the darkest corner, and cocked the pistol in my pocket, determined not to discover myself until I had an opportunity of seeing something of the stranger. There was a long pause which showed that he had stopped. Then once more the footsteps approached and a shadow fell across the opening of the hut. “Look out! It’s coming!” There was a thin, crisp, continuous patter from somewhere in the heart of that crawling bank. The cloud was within fifty yards of where we lay, and we glared at it, all three, uncertain what horror was about to break from the heart of it. I was at Holmes’s elbow, and I glanced for an instant at his face. It was pale and exultant, his eyes shining brightly in the moonlight. But suddenly they started forward in a rigid, fixed stare, and his lips parted in amazement. At the same instant Lestrade gave a yell of terror and threw himself face downward upon the ground. I sprang to my feet, my inert hand grasping my pistol, my mind paralyzed by the dreadful shape which had sprung out upon us from the shadows of the fog. A hound it was, an enormous coal-black hound, but not such a hound as mortal eyes have ever seen. Fire burst from its open mouth, its eyes flowed with a smouldering glare, its muzzle and hackles and dewlap were outlined in flickering flame. Never in the delirious dream of a disordered brain could anything more savage, more appalling, more hellish be conceived than that dark form and savage face which broke upon us out of the wall of fog. After a month to worry and fret, Londoners finally got to read the final serialized episode, which was the last part of Chapter 14, and then Chapter 15. Chapter 15, “A Retrospection”, took place in the Baker Street rooms in November, a month or so after the resolution of the case. In the intervening time period, Holmes had solved two other important cases. In the first, he exposed the atrocious conduct of Colonel Upwood in connection with the famous card scandal of the Nonpareil Club, and in the second he defended the unfortunate Mme. Montpensier from the charge of murder which hung over her in connection with the death of her step-daughter, Mlle. Carere, the young lady who was found six months later alive and married in New York. 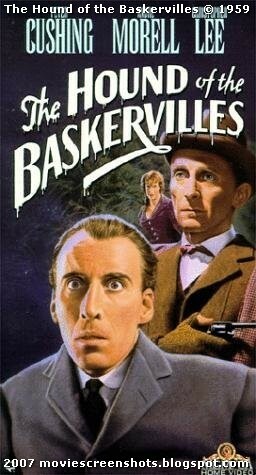 So ended The Hound of the Baskervilles. The information source used to determine the original breakpoints was the pdf copies of the original The Strand Magazine found on the website of Stanford University, Palo Alto California, USA. These are pretty interesting, and have many notes and extras for the Sherlockian. However, they are big files. If you are on dial-up, it will be painfully slow. If your fast connection is not lightning-fast, you will notice download times that are longer than normal. Want to read the whole thing? Just click into “Doyle’s Works” in the Sherlockian Links sidebar on the right. Because of its popularity, “Hound” has been made into movies many times. This one was my favorite, probably because I was the right age and it was a Hammer Film. I expected to see Hazel Court, every teenager’s ideal older woman, breathing deeply. Unfortunately, she was not in it. But there was a tarantula, which is important! Oh, well. After the final installment in The Strand Magazine, the public need not long wait for the book edition of The Hound of the Baskervilles. Reference: “Advertisement,” The Strand Magazine: An Illustrated Monthly 23 (Jan.–June 1902): lxvii, http://books.google.com/books?id=KawvAAAAMAAJ (accessed 18 Apr. 2009).